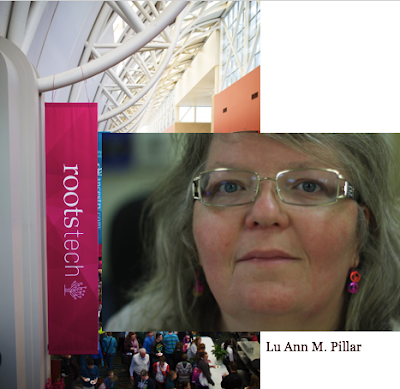 As promised, Lu Ann M. Pillar, aside from all the excitement of being at RootsTech, contacted us to let us what a great time she was having. We are so appreciative of her and her effort. It was great getting to know her through the experience. I am especially happy to have made a friend. Scott Hamilton! He is very inspiring and a really good guy! He's always been an elegant skater, full of fun and joy, let alone amazing moves. Oh, the backflips he's done on ice began right here in SLC! His life's story is so heart warming, even though it's filled with sadness and tragedy. 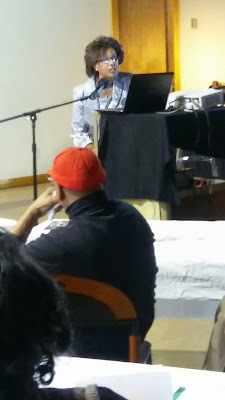 I felt a personal connection, being a positive person myself, but felt re-inspired to remind myself of my many good fortunes having listened to him. He makes one walk away feeling better about the world. 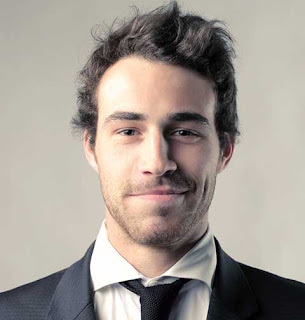 Thomas MacEntee is always extremely helpful, and yesterday's class "Did I get everything?" did not disappoint. He is another generous and witty human being. I've never had the courage to do a do-over with him, but I might, given his intensive record keeping process. Will I do it right? Maybe, but I'll surely do it better. Today, Angela McGhie's class "Alternative Sources for Vital Records" was particularly helpful. I have a great grandmother who's birth record burned in a fire in Cuyahoga County, OH and she gave me several ideas that might help. Currently, I'm sitting on floor charging my phone in order to get a "selfie" with Scott Hamilton in the Expo later! I'm also looking forward to tomorrow's keynote, Henry Louis Gates, Jr. When planning for this trip, I thought I'd sneak out of the Conference to get to the FHL for a little research, I mean, it's BLOCKS away. Maybe during lunch tomorrow, but I'm not really sure I'll be able to leave until the exact time to catch my flight. So many classes, so many people, so little time! PS: I was too late to selfie w Scott Hamilton as the line had been cut off for some time. Lesson 1: If something is a priority, go early and be willing to stand in a line. (The crowds make that an obvious lesson, but I am slow to accept the reality, lol.) Instead, I'm in Curt Witcher's class "An Ancestor's Death: A Time for Reaping" and hope to gain insights for some of the more reclusive actors' final scene. I got to shake Professor Gates' hand today, after listening to his story of a lifelong interest in tracing his roots. He is an estimable man, for sure. He is doing good things in the world, uniting us all through DNA. The attached pic is all I could manage. We Go to School, But You Do Not Teach About Our Freedom! I can remember being in the 3rd grade at St. Cyril's school in 1973 and sitting there after I had been called a "N-----!" I had never heard that word before. It was a boy in class who had trouble staying out of trouble. No one could hurt my feelings at school. I was one of the smartest children in class. Maybe that was the reason for the name calling. When I got home I asked my parents what is a "N-----?" They said it was what some white people called African Americans. This was my introduction to racism. That young boy did not like me because I was smart and well mannered, and he saw me as a threat. I'll never forget how I dealt with that boy and protected my character without telling anyone at school. I began to go to the Joliet Public Library every Saturday because they had different books than my school. I read about the life of W. E. B. DuBois and Frederick Douglass as my first books. I took these books everywhere I went even school. From grade school through the university days there was never any mention of the books I read. My daughter was homeschooled most of her school days. 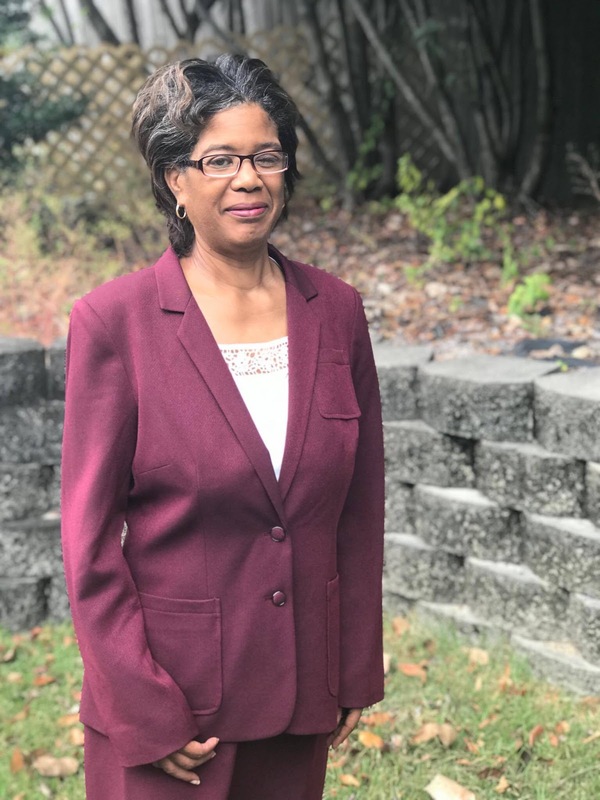 By the time she went to school, she was prepared in gospel teaching and history. I looked at my granddaughter and thought, "What more can I do?" I know I can continue our family history. She can learn a great deal from our forebearers. The National Archives is one place these records can be found. If the stories of our true history were told in school, grade school, high school, and universities, how would those children turn out? It could mean the end of racism as we know it today for everyone would know African Americans were prepared long before the Civil War to fight for freedom. I will share history that I find before 1776 through the present. To the African Americans who are coming to my blog for the first time, document you history, and tell it. There are people of every color, but some are bad. You have to know your history so you will not succumb to the person they expect you to be. You need to be the best example that you can find in your family. Thinking back again to my experience at St. Cyril's, I remember his face. I remember his hair. I remember his character. I am grateful to him because I have found true history because of him. 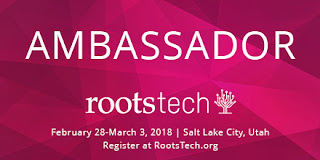 Free RootsTech 4 day Pass Winner! YAY! Lu Ann M. Pillar is the winner of my official RootsTech 4 Day Pass! 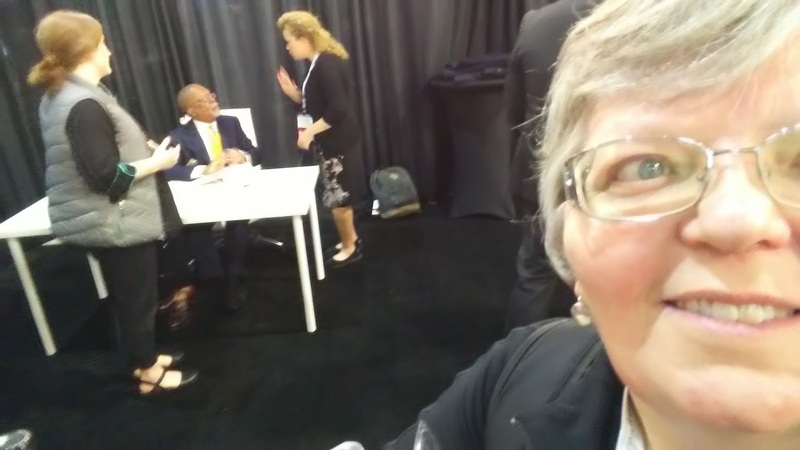 We will post some of the photos she shares from RootsTech, and some of her favorite events. 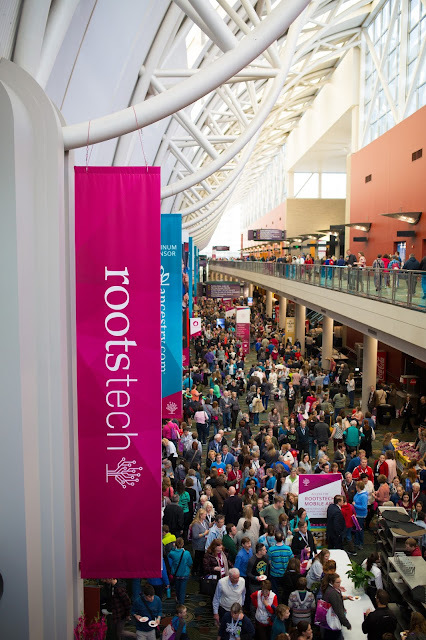 Enter to Win Free RootsTech 4 Day Pass! 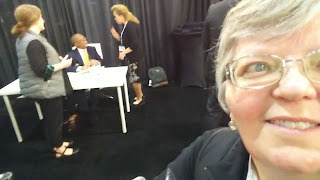 As an Official RootsTech Ambassador, I have one RootsTech 2018 4-day pass to give away to a very lucky reader (a $279 value). You could be a FREE participant to the world's largest genealogy genealogy conference! 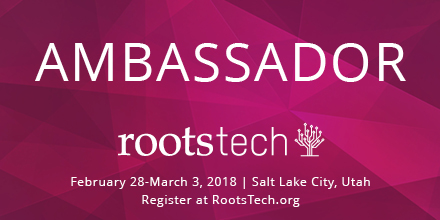 This is good for one FREE RootsTech Pass 2018. It includes the registration fee for over 300+ classes, Keynote General Sessions, Innovation Showcase, Expo Hall, and evening events. This registration does not include travel, hotel, meals, labs or any other compensation. The Getting Started and free Family Discovery Day Pass are not included, and must be added on separately. Enter only if you plan on attending. Only one entry per person will be valid. Selection made by random drawing. This contest will end at Wednesday, November 29, 2017 at 8:00 pm. The winner will be contacted by e-mail the following day. The winner will be encouraged to send photos and favorite experience at the RootsTech event. We will include what they send here. To enter, simply "Follow By Email" on the left to subscribe to this blog. If you have subscribed before, enter by sending e-mail to robin.savingstories@gmail.com. Good luck! I feel as though I need to thank my followers for the encouragement and many heartfelt prayers offered up on my behalf. A little over a year ago I suffered a stroke. I was in my daughter's dining room. I asked them to call an ambulance because I could not feel the right side of my body. My daughter, Adrianne, who was about 7 months pregnant with her first child, became the person who was my mouthpiece at the hospital along with my husband. I could not move or speak. I am not able to remember those few days. They have taught me the things I needed to know. I vaguely remember the hospital. I was taken to rehab. Everyday for about three hours I went to work on moving my arm, my leg, and speech. I had to learn how to talk and write with my left hand. I remember watching General Conference in the rehab. I was told the good Bishop of the Phenix, AL and Counselor had given me a blessing while in the hospital. I did not remember, but I did remember something that I could not at the time explain. Back in March, I was told by Heavenly Father that "soon you will go to the hospital" to fix what is wrong with you. I did not know it would involve a stroke. When I had the stroke that was not the problem. I continued rehab for a week, and went home to my son-in law and daughter. My husband took over my care because my daughter was put on bed rest. I went to Church. During the week all four missionaries and two Sister missionaries came to see me. I read The Book of Mormon with the missionaries, and visited with the Sisters. 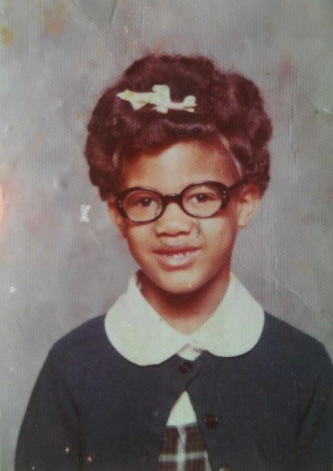 Long ago, Adrianne learned to read using The Book of Mormon. Now I was learning to a read again using The Book of Mormon. Adrianne had a hard pregnancy, but delivered after her husband came home. I had to go back to the hospital. I was having a very bad pain and high blood pressure. This is when I learned I now was in the hospital to fix what the Lord had told me I would. My husband watched the monitor that shows blood pressure. There was a number that he did not understand that read extremely high. A cardiologist was walking by so he asked him what it meant. The cardiologist asked if I was diagnosed with Atrial Fibrillation. I had atrial fibrillation. I had it all my life. I am happy to be back and to feel better. A couple of months ago I visited the neurologist who tested me. She said that I had two forms of memory. One that I could lose, and one that I cannot. She said that I would never lose spiritual memory and genealogy. I am glad that even though I never transferred my membership to Phenix, AL they served me as if I belonged there. I am glad I could understand General Conference, and the missionaries surrounded me with love. I am glad I have the love of many online. And much love to my daughter, son-in law, husband, and Brie!